DETROIT -- General Motors’ U.S. sales rose 1.5 percent in November, as strong demand for pickups, SUVs and crossovers offset weak car sales and helped the automaker to a record transaction price of $35,800. GM, in a statement today, said retail sales last month rose 4.4 percent, to 183,141 vehicles, while fleet sales declined 9 percent, to 46,155. GM said it gained retail market share for the eighth consecutive month, as the company continues to reduce rental-car deliveries in a bid to improve resale values and the image of its brands. For the year, GM’s rental deliveries have fallen 11 percent while sales to commercial customers -- a more profitable business line -- have risen 13 percent. Sales to government customers were up 1 percent through November. Chevrolet led GM’s four brands with 4.8 percent overall sales growth in November, to 156,907 vehicles, bolstered by deliveries of the Chevy Trax small crossover (launched in December 2014) and the Colorado midsize pickup. Sales of the Silverado pickup -- GM’s highest-volume U.S. vehicle and among its most profitable -- rose 5 percent for the month and are up 14 percent for the year. 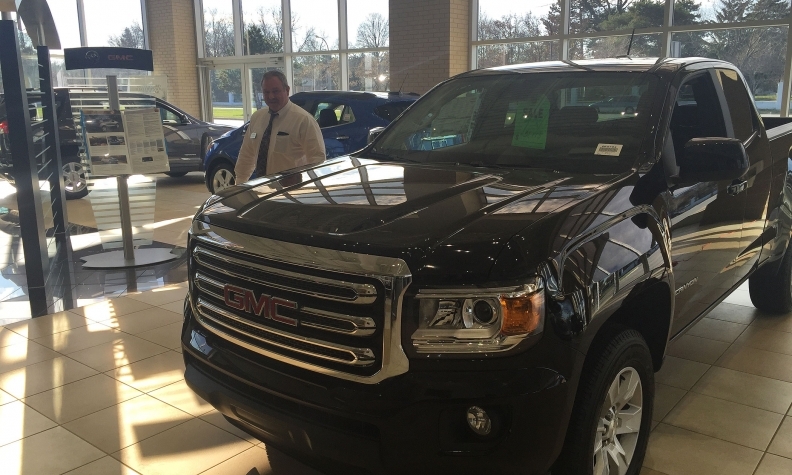 GMC sales slipped 1.9 percent, snapping a streak of 12 consecutive year-over-year sales gains. The Sierra pickup was the brand’s only decliner, down 27 percent. Buick sales sank 17 percent. The brand continues to rely on the popularity of its two crossovers, the large Enclave and small Encore, amid weak demand for its three sedans: sales of the LaCrosse, Regal and Verano each fell at least 34 percent. Cadillac sales rose 1.8 percent on a 53 percent jump in sales of the SRX midsize crossover, which will be replaced this spring by the XT5, a full redesign. GM is cashing in on the industrywide shift away from cars and toward crossovers. Its crossover sales rose 26 percent in November, while truck deliveries (pickups, SUVs and vans) grew 3.8 percent. Car sales slid 18 percent. “The phenomenal growth of crossovers in a record-setting market is the biggest sales story of 2015,” Kurt McNeil, GM’s U.S. vice president of sales operations, said in the GM statement. The company views the popularity of crossovers as a long-term shift, said Mustafa Mohatarem, GM’s chief economist. “We expect customers will continue to embrace crossovers and SUVs because they are meeting their fundamental needs for utility, comfort and fuel efficiency,” Mohatarem said in a statement. GM’s average transaction price (ATP) rose $580 from a year earlier to $35,800, the company’s highest on record for any month. Its incentive spending fell from a year earlier, to 10 percent of the ATP, down from 1.2 percent a year earlier, GM said, citing data from J.D. Power. The company said the industry’s incentive spending rose to 10.5 percent of ATP, from 10.3 percent a year earlier.